Today was Day #1 of Chocolate, Grasses and Grains Theme Week (part two). Earlier this year I ran part one of this theme week, with chocolates that contained grass and grain-related inclusions. These chocolates also needed to be gluten free. 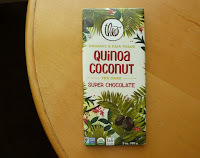 I hunted for chocolate items with wheat and barley alternatives, such as quinoa, corn, rice and oats; and I eventually acquired enough bars, confections, cakes and cereals for a sequel. This week is that sequel. 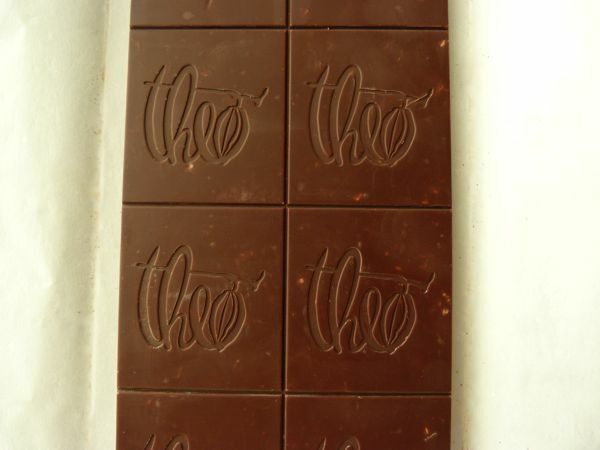 Theo Chocolate (Seattle, WA) founders were part of an early wave of new American craft chocolate makers in the early 2000s that embraced the connections between enlightened supply chain practices, healthy eating and successful, quality product. The success of Theo and other craft chocolate makers also hinged on enlightened consumers who would value what they were doing and who would pay a bit more for good chocolate. Thankfully the market for better chocolate has continued to grow. ...I admit to raising an eyebrow when I read the reference to Super Chocolate and a "uniquely formulated cocoa extract" on the packaging. Cacao mass, cocoa powder and dark chocolate already naturally contain antioxidants (e.g. flavonoids or flavanols), minerals such as magnesium and iron, and other substances of interest to one's health and/or well-being. Presumably this Theo extract* boosts levels of desirable, health supporting qualities? Apparently it does. But, how this post-harvest related process(ing) or extract was incorporated wasn't 100% clear from the packaging, in part because it's part of the company's own proprietary process. This is all well and good, but I've appreciated this newer generation of American chocolate makers' tendency to be more transparent about their supply chain and to fiddle less with ingredients. I hope Theo will continue to remain so as they grow their company and offerings. For those readers who couldn't care less about polyphenols or processes, and who tuned in to find out how this chocolate tasted, let me get to that. 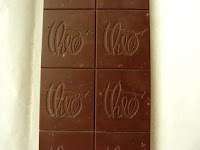 I broke off the first "Theo" embossed square of this bar and gave it a sniff. The bar broke with a hard snap,** and gave off a mild aroma of coconut, sweet chocolate, and a very subtle hint of sesame or seed brittle confection with a touch of vanilla. The dark chocolate (75% cacao) base had an even, smooth dark flavor and the tiny roundish bits of quinoa gave the bar a pleasant, subtle crunch. *In 2014, Theo Chocolate announced Violetamine (tm), the first in a line of "functional" ingredients, manufactured by Theo Innovations. It wasn't clear if the extract in this bar is the same, or whether it relies on similar processes. **A chocolate bar that breaks with a hard snap is thought to have been well tempered. Tempering is a process (that falls toward the end of the multi-step chocolate making process) that involves precise heating and cooling of chocolate and that leads to bars that have a desirable and relatively stable crystalline structure. 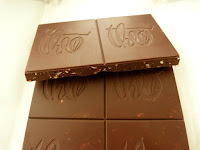 Tempering, or an ideal temper, will not always be correlated with flavor or taste but has long been considered desirable and may affect the appearance and texture of a bar.